100 bags per pack. For cooking, these bags can resist temperature at a max. 115.5°C/ 240°F. 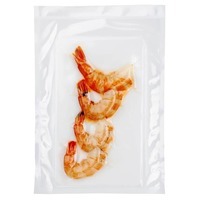 OPP/CPP cooking channeled vacuum bags are ideal for preserving and cooking foods using external extraction machines or machine equipped with the EASY accessory. The special combination of the Orved diamond embossing and the resistance of the Orved smooth cooking film led to the perfect bag for prolonging storage and for perfect sous-vide cooking using a water bath, thermostatic bath, or steam oven. 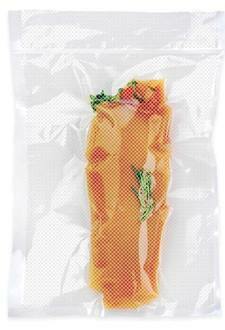 Embossed cooking channeled vacuum bags are ideal for those who wish to cook foods sous-vide, even at home! Products cooking inside the embossed bags have more intense aromas and colours while at the same time preserving their organoleptic and nutritional properties.